After fending off accusations of liberalism from opponent Gary Gates throughout their special election race, Rep. Lois Kolkhorst got to respond to her main challenger face-to-face Tuesday night. After fending off accusations of liberalism from opponent Gary Gates throughout their special election race, Rep. Lois Kolkhorst, R-Brenham, finally got to respond to her main challenger face-to-face Tuesday night. "There’s been a great deal of money spent by Mr. Gates to smear my record," Kolkhorst said, going on to list her conservative credentials, including a long list of endorsements from statewide Republican leaders and PACs and more than a decade of service in the Texas House. “I’m the only one on the dais with a proven conservative record." Gates is the only candidate likely to pose a threat to Kolkhorst in a five-way race to to fill Comptroller-elect Glenn Hegar’s District 18 Senate seat. Gates, a real estate agent and cattle rancher, has spent much of his campaign accusing Kolkhorst of being a liberal. Kolkhorst, Gates and businessman Charles Gregory, the third Republican candidate, met Tuesday night at the Victoria College campus for a debate hosted by the Victoria Advocate. The two Democrats running, Cynthia Drabek and Christian E. Hawkins, did not attend. Gov. 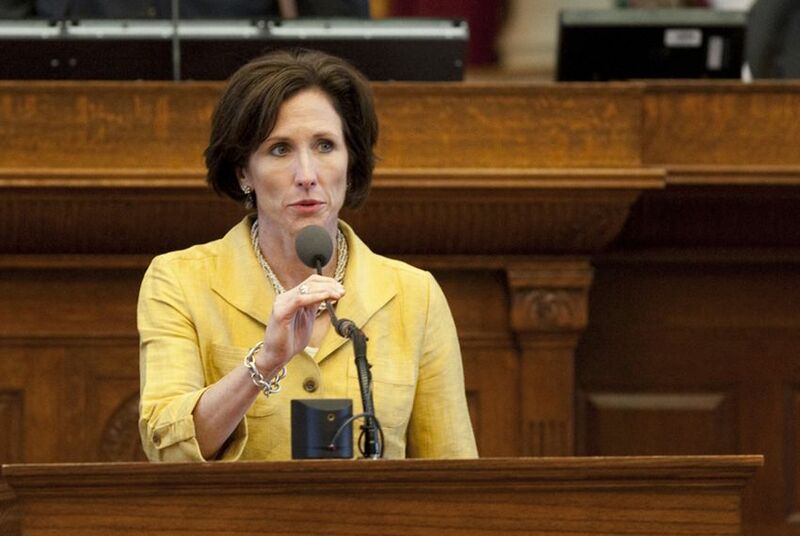 Rick Perry, Gov.-elect Greg Abbott and Hegar have all endorsed Kolkhorst, who has represented Brenham in the Texas House since 2000, and is pitching herself to voters as the experienced candidate. Gates and Gregory, in contrast, emphasized their “outsider” status during the debate. “I am not motivated by power, I am not motivated by money and I am not a career politician,” Gregory said during his opening statement. Much of the rhetoric in the special election has been on border security — both Kolkhorst and Gates have run ads on the issue and said securing the border is a top priority. Gates said that instead of sending state police and National Guard troops to the border, Texas should consider funding the law enforcement agencies already at the border. Gates also spoke out against Texas' in-state tuition policy for undocumented students. “I just think it’s wrong that an illegal immigrant can cross the Rio Grande and get in-state tuition,” Gates said. Gregory says Texas should follow in Arizona's footsteps and give law enforcement “some teeth” to enforce immigration laws. “We have a problem in this state, because we put a lot of people on the border but we don’t give them the means to enforce what they are there to do,” Gregory said. Candidates also had different takes on funding for transportation. Gregory was the only candidate who said he was against Proposition 1, approved by voters last month to provide billions in transportation funding. Kolkhorst said Proposition 1 provided much-needed funding towards infrastructure, but she said the Legislature should do more to increase transportation funding, like ending diversions to the state Department of Public Safety. Kolkhorst said she does not think the Legislature will address the public education financing formula in the 2015 session. "One of the things that I believe will happen next session is we will not tackle the formula,” Kolkhorst said, noting it would be hard to pass a bill while the appeals in the school finance lawsuit are ongoing. During closing statements, the debate turned more personal. “Don’t let someone else smear my record,” Kolkhorst said, referencing Gates' attack ads. Kolkhorst also criticized Gates, saying he spent more than $1 million of his own money on the campaign. Gates said he was happy to spend his money on what he believed in. Gregory ended his closing statements with an appeal to Tea Party conservatives. "The only person who is going to be a Ted Cruz in the Senate … is me,” Gregory said. Early voting ended Tuesday, and Election Day is Saturday.